There is more to Vietnam than rich tradition and history or mouth-watering food; it is also an ideal destination for travelers who love seeing nature, especially hikers. That is why Greenvisa company compiled a list of perfect spots for tourists to enjoy this outdoor activity. The landscapes of the country offer travelers a unique experience. This is the place where they can hike through several highland valleys and underneath towering limestone mountain ranges. On top of the list, Fansipan is known as the tallest mountain in Vietnam and entire Indochina peninsula. It is situated in the Northwest of Vietnam and is a famous destination in this corner of the country. Fansipan belongs to Sapa which is home to several ethnic minorities such as Dao (Yao), Hmong, Giay and more. Undoubtedly, Sapa is considered as the premier hiking destination for every foreigner coming to Vietnam. Another ideal place for travelers to trek is Mai Chau in Hoa Binh province. It takes about 135 km from Ha Noi capital and attracts a huge number of tourists every year. This picturesque landscape is surrounded by the green valley and stilt houses of several ethnic minority groups. The largest ethnic populations of this area are White Thai and Black Thai. For quiet rural scenery, US foreigners are advised to take a trip to Phu Luong Reservation. 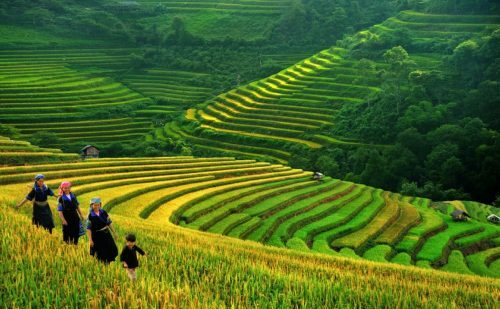 It is located in Thanh Hoa province, along two parallel mountain ridges stretching from Northwest to Southeast and divided by a central valley. Sharing the borders with three provinces including Ha Giang, Bac Kan, Tuyen Quang; Cao Bang is completely a trekking place with the high mountains twisted with streams, rivers, and untouched jungles. The “Ban Gioc” waterfall is a well-known natural feature in this province. It simply is an incredible scenery with beautiful landscapes. Additionally, Ba Be Lake and National park are great choices for those who love lake landscapes. This lake is the largest natural lake and the centerpiece of several national parks in Vietnam. There is a vast of hiking trails in this destination. Travelers can have a memorable experience when discovering several picturesque landscapes with a number of lakes, rivers, caves, waterfalls, and valleys. The greatest way to experience and explore this stunning place is on a multi-day trek. With the area of 25,000 hectares, Cuc Phuong is also known as the oldest national park of Vietnam. It is famous for the biological richness of the forest and is home to a lot of patches of primeval forest and flora species, embracing ancient trees and ligneous creepers, parasitic plants. There are some day hikes available in the park, whether with a local guide or self-guided. Thanks to the development of technology and open policy of Vietnam government, nowadays it is more convenient for US travelers to trek in Vietnam. Apart from the traditional way of getting a Vietnam visa USA at the embassy, they now can get a visa at anywhere around the world by hiring a government-registered company like Green Visa Vietnam Agency.